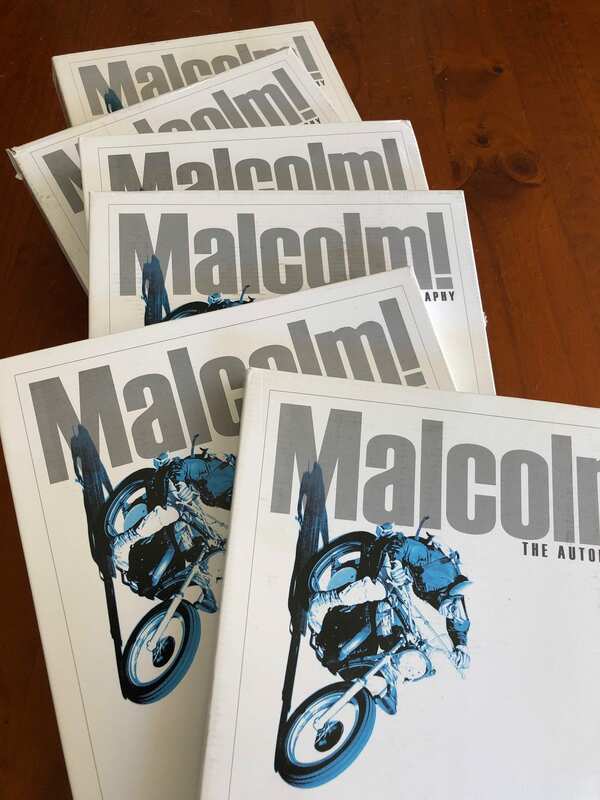 This book is as big as the story itself, a huge 401 lavishly illustrated page hard cover coffee table center piece ! 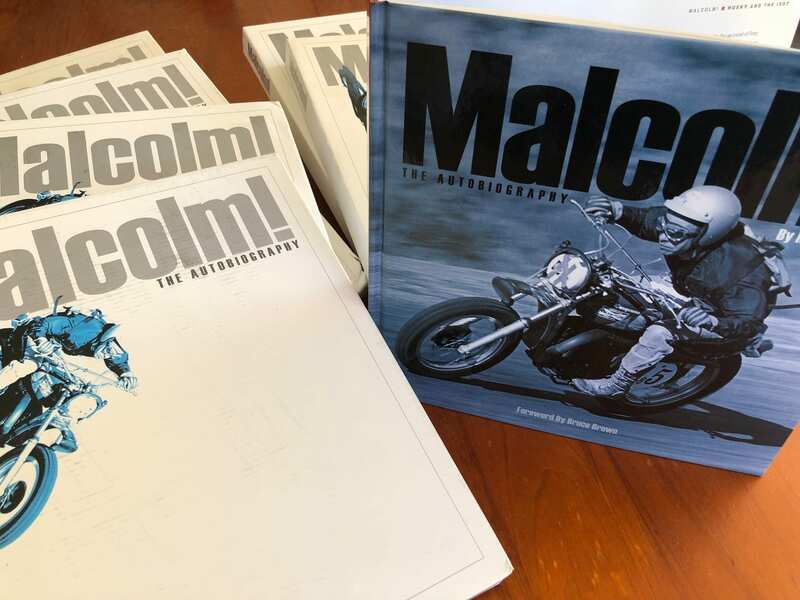 Perhaps one of the most well known and accomplished motorcyclist on the planet Malcolm’s book is saturated with personal storytelling and includes many never before seen photographs from his own personal archive. 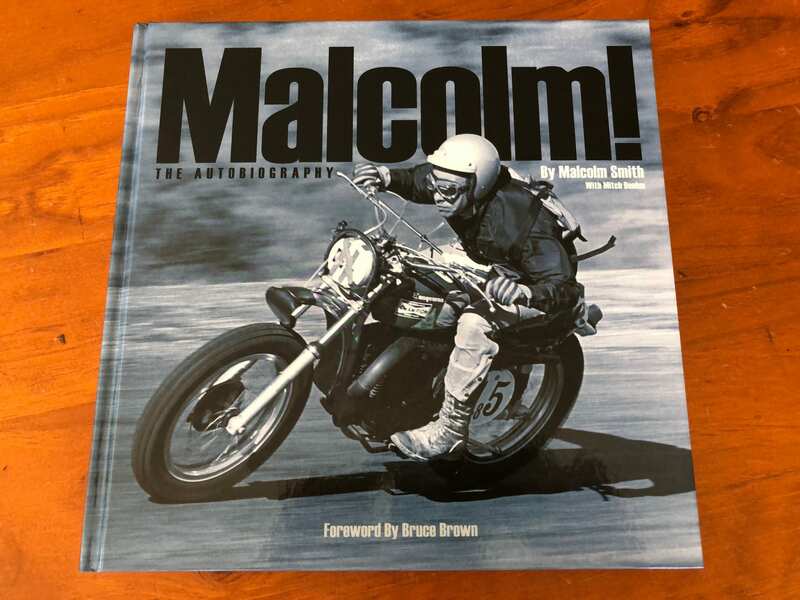 This book is an absolute must have for any motorcycle enthusiast. Mounted on the only under 200cc Bultaco Frontera in Australia I competed along my brother Graham and Lou Sherman on the Don Newell Queensland Bultaco Team in the legendary 1976 Forest 300 in Dungog NSW, the only event Malcolm Smith ever rode in Australia. I swear I must of been the youngest participant in the field and to this day still own the same red enduro jacket with legendary faded Bultaco logo on the back ! Karen and I as a very young couple moved from Brisbane to Darwin in the late seventies jumping on the back of a city rebuilding after cyclone Tracy. 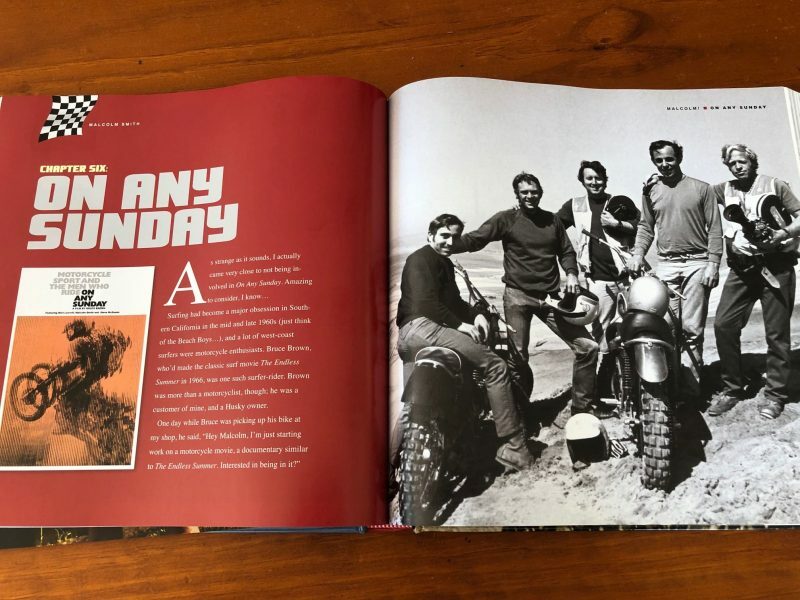 With assistance from my friend Geoff Udy and Hans Appelgren we sold Husqvarna motorcycles and accessories out of a spare bedroom in the house as a part time gig till then SA and NT Suzuki Importer Graham Cornell offered us a partnership in the first ever Suzuki/Husqvarna Dealership in Darwin. Vice president of the Darwin Motorcycle Club I couldn’t of been more active, a front runner in every Kamfari, I also rode Finke, Tea Tree to Alice, Mt Isa to Calooweal, Suzuki 8 Hour and every damn event that existed. If I wasn’t racing them I’d be organizing them. I also raced the very first quads in Australia when they appeared in 1984 and got that happening to a respectable level. In 1985 I won an Australian Four Day Enduro Championship as a Team Manager. No one had ever assembled a team from the Northern Territory and till today no one has repeated the effort either. A mammoth task from where we were located I put together a team of our best available Darwin swamp riders, Katherine rock riders and Alice Springs desert riders and managed to get them all and their bikes to Bredbo south of Canberra. Most of these guys had never seen a mountain and here we were riding trails called hang glider and ski jump. To win the team’s event outright against Australasia’s cream of assembled enduro legends was a very very proud moment indeed. I’ve volunteered and also ridden sweep at many a four day enduro since and still love the comradery amongst our fellow enduro, vinduro and adventure riders. The late eighties we lived in Port Douglas and one of the very rare times of our lives we were not in the motorcycle industry. Geoff Eldridge also bought a house at this time in Cairns and we all became good friends hence why I got featured many times in ADB magazine because it surely wasn’t based on talent !! KDX200 mounted I rode every event possible including the iconic Weipa Croc Runs a very popular enduro in it’s day. A shift back to our routes of SE Queensland were Karen and I built Gold Coast Suzuki at Burleigh Heads. RMX250 and DRZ250 mounted I continued racing the vets classes before taking on the new to Australia Aprilia Franchise. Temptation was too great and I entered unknown territory of the then popular Australian 250 Production Championship. The oldest guy in the field didn’t faze me and I took to road racing like a duck to water, I loved it, just a shame I hadn’t discovered it sooner and I raced many many classes of road racing and motard till well into my fifties. 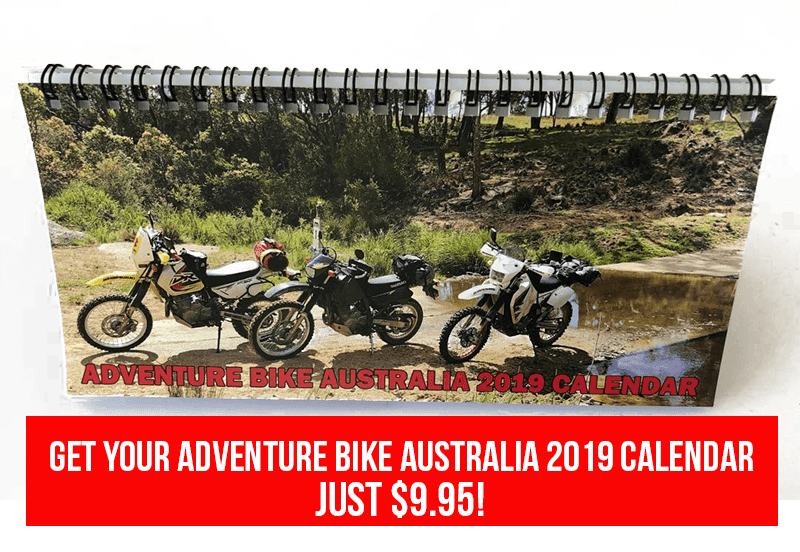 We sold our Dealership to younger buyers in 2013 and continue today with our niche business Adventure Bike Australia.